If you want more details, head over to the Instructables post. Here is the project enclosure. 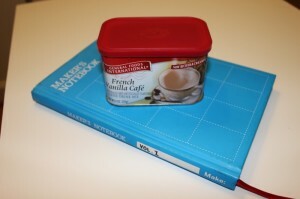 Admit it, you love you some Maker’s Notebook, too, don’t you? The MP3 Trigger sits snug as a bug in a rug with the machine screws and nuts anchoring it in place. 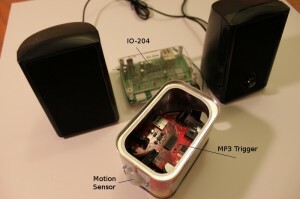 2 additional ones hold the PIR Motion Sensor to the front of the tin. Getting the larger hole in the front and back was tricky because I did not have a great pair of snips around. I’ll know for next time! I did manage to wear through several Dremmel bit tips in my stubbornness of using the wrong tool for the job. Here she be all wired up. Note, she AIN’T wired to the LAN, so this is using the “Onboard Rules” feature. If I did want to datalog the session, I would have to plug in to my router (which in this case really is not more than 10 feet away). Nice. But, come on, U2? No “Eye of the Tiger?” I think we need a training montage. Thanks for taking a look at the project. You would be able to trigger multiple devices off the same sensor. Or have the device trigger off any one of several sensors. 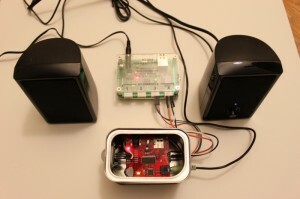 However, having the device I use play multiple mp3 tracks at the same time is not possible to my knowledge. That would be a limitation of the player itself. There is also only one audio output jack on the device.